Have you ever done something that you regret? I am not sure that I have ever met someone that has not regret something in his or her past. Everyone makes mistakes, and those mistakes can create that dreaded feeling of guilt and/or shame. How can I move forward after making a mistake? You can start by practicing self-compassion. While it can be challenging to love others, sometimes it can be more challenging to love yourself. Dr. Brown discusses ways of loving yourself is the core of practicing self-compassion. Below is a simple list of ways to move forward in your life by practicing self-compassion. Understanding Guilt Versus Shame. Guilt is identifying a feeling of I did something wrong and stating, “I made a mistake.” Shame is identifying a feeling of “I did something wrong” and stating, “I am a mistake.” While they may sound similar, they are completely different thought processes. It is normal to allow yourself to feel some guilt, but once it becomes shame, it can be very destructive. Accepting that feeling of guilt and not allowing it to escalate to a level of shame is a more effective way to move forward. Understanding Criticism Versus Complaint. Everyone makes mistakes, especially while at a job. Remind yourself that if your supervisor calls a mistake to your attention, they are likely providing you constructive criticism as opposed to stating you are a bad employee and making a complaint about you. Reminding yourself there can be learning curve to any job can also take off the stress for you, especially if it is a new job. Stop “Shoulding” Yourself. If you want to spend your day going to a movie, shopping, the gym, or wherever you feel would make you the happiest that day, embrace it and do it! No need to tell yourself, ‘I should be doing more work today,’ or ‘I should be studying for the exam that is next month.’ Practice being in the moment and embrace those special self-care days. If you have decided to take the day practicing self-care, “shoulding” yourself can take away that enjoyment. Tell Yourself, “So What? !” Some co-workers, acquaintances, or relatives may not support your thoughts and or ideas. They may even not like you; unfortunately, not everyone you meet will like you. When someone you know is choosing to have a poor attitude about you, you can simply say, ‘So what” in your head. We can’t control what others think about us and it is important to surround yourself with others that support you. It can be cathartic to say, “So what?” because it takes away the power that person’s actions once had on you. Talk to Yourself Like You Would Want To Be Talked To. Would you like it if your friend said to you, “You are not good at X, Y or Z”? Probably not. Practice by saying positive things to yourself while looking in the mirror. Attempting to practice self-compassion can be challenging; however, it will likely provide you with a healthier and more meaningful life. 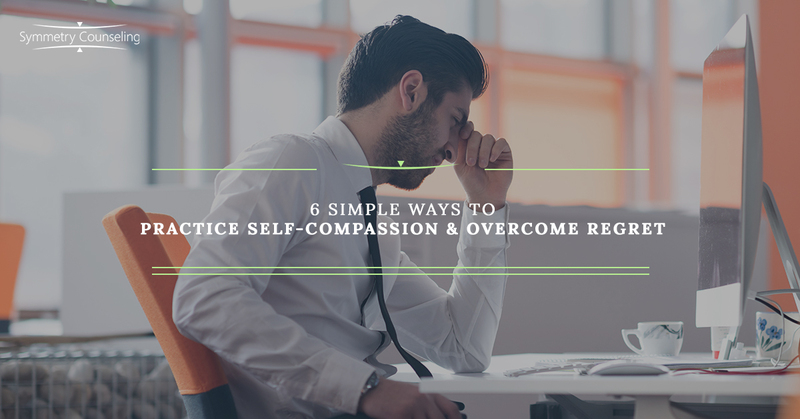 While this list provided six different approaches, try to focus on the one that you think will allow you to best practice self-compassion in your life. If you are currently struggling with practicing self-compassion in your life, it may be a good idea to connect with one of our skilled counselors at Symmetry Counseling today. You can contact them at 312-578-9990 to set up an appointment. Brown, B. (2010). The Gifts of Imperfection: Let Go of Who You Think You’re Supposed to Be and Embrace Who You Are. Your Guide to a Wholehearted Life. Minnesota: Hazelden Publishing.